To some of you, today’s outfit might be a bit much. Too me, it is a perfect pink explosion. Let’s start from the bottom up…and begin with my pink studded flats. I love them and I’m so comfy in them. 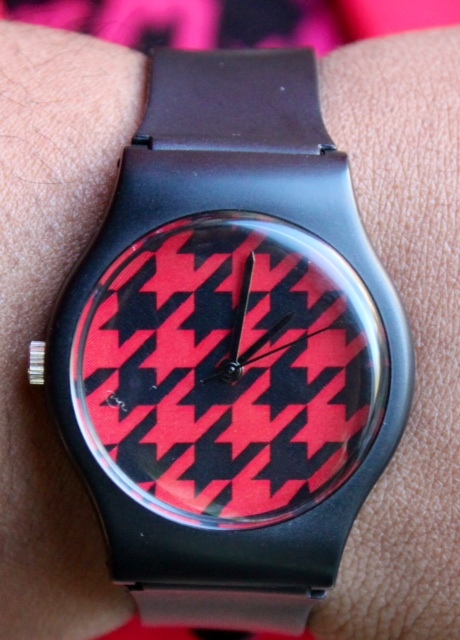 Then add a pink and black houndstooth watch. I bought it on Fab.com (if you haven’t joined Fab.com you should, I love it!) a few months ago and have actually worn it a lot. Don’t ask me what time it is though, I have no clue since there are no numbers. I like to guess a lot when wearing this watch. And then there’s the actual dress. I walked by an H&M on Saturday and bought something from there for the first time in a good 8 years. 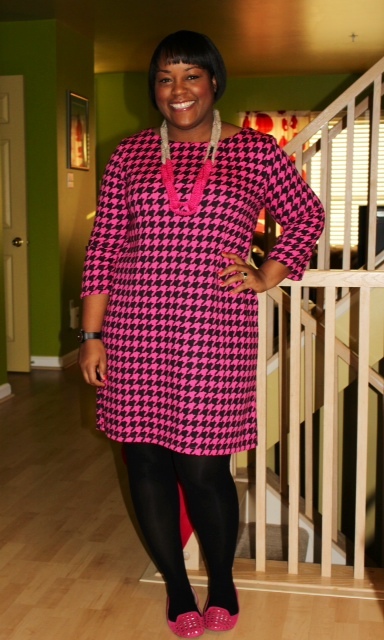 This neon pink houndstooth dress was calling my name from the window and it was under $18! That was an easy decision to make. It even has an exposed half zipper on the back. I can belt it and wear it with a blazer but I decided to just wear it on it’s own. It’s got a nice mod feeling to it. Plus it gave me another excuse to wear my knitted link necklace I made. 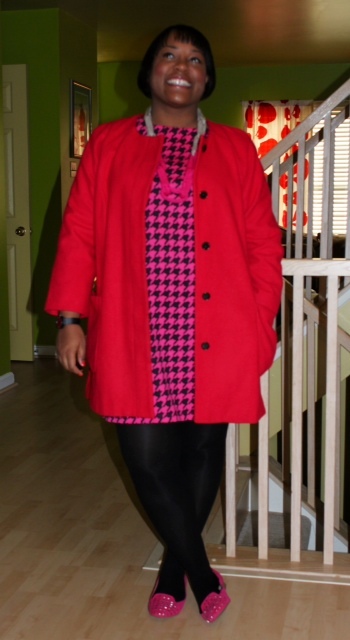 And if that wasn’t enough pink for you, I wore my hot pink three quarter length sleeve coat from Old Navy. I pinned this on Pinterest several months ago and then found it on the Old Navy clearance rack for $25. I love a good bargain. So that’s my pink explosion, overload – what color do you overdose on? I don’t think it’s an overload – I think it’s perfection! What a great way to play with different textures and unify it all with the color – looks fab! Love the necklace, I want to see a close up. Please. I OD on purple, fuschia, and mustard yellow. I am in love with your hair; it looks sleek and polished. Blog post about the hair products you’re using on deck???? @Chandra my hair care routine never changes. I’ve had my hair chemically relaxed for years (just got it down a few days before that picture was taken) and I use Carol’s Daughter hair balm and I flat iron it. That’s it. Sometimes I use a deep conditioner or cholesterol but I don’t really change up the routine a lot. It’s all about the hair balm for me. I love the shoes!! And you can never have enough pink!